Magnum Club are thrilled to announce the first ever Hong Kong appearance of Maarten Hoogstraten from the massive electronic dance duo Bingo Players on Thursday 12th December. Hailing from The Netherlands, Bingo Players have created an international reputation through epic releases and a massive touring schedule, kicking off 2013 scoring a worldwide top ten hit with their single Get Up (Rattle), which was a number one single in the UK two weeks in a row. Not new to charting success, with a horde of huge tracks including the 2011 hit Cry (Just A Little) and most recently with Out Of My Mind, the duo doesn't stop at producing hit records and touring the world; they also run their own label. Hysteria is Bingo Players' label that is home to their hits Rattle, Cry (Just A Little), Out Of My Mind, L'Amour, Mode and many more from artists such as Bassjackers, Alvaro and Gregori Klosman to name a few. In 2013 Bingo Players will bring you more epic releases, an enormous live show and something to talk about with over 30 worldwide music festivals under their belts including Tomorrowland and Stereosonic, Ultra, Electric Zoo and a primetime slot at Electric Daisy Carnival: Vegas. 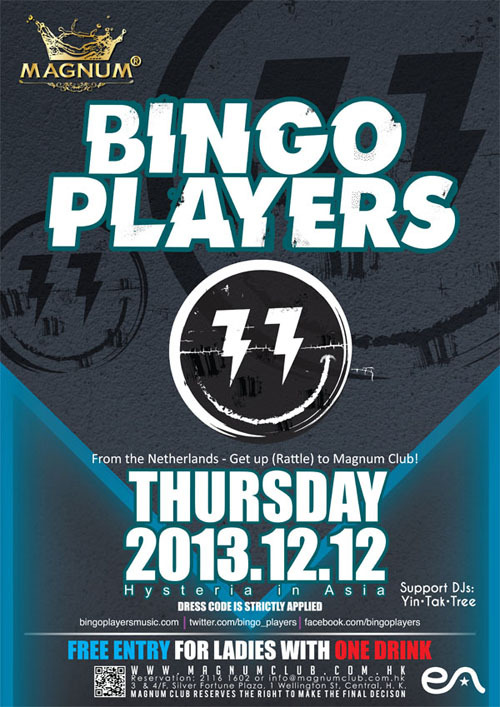 Be warned, be prepared, Bingo Players are coming to RATTLE Magnum Club on Thursday 12th of December! Hailing from The Netherlands, Paul Baümer & Maarten Hoogstraten have fused their musical talents into the massive electronic dance duo Bingo Players. The two dutch DJs have created an international reputation through epic releases and a massive touring schedule. Bingo Players kicked off 2013 scoring a worldwide top ten hit with their single Get Up (Rattle), which was a number one single in the UK two weeks in a row. This success came after the original version of Rattle shook up European charts for nine weeks during 2012. Bingo Players are not new to charting success. Early on, Paul & Maarten lit up the Beatport charts with a horde of huge tracks including the 2011 hit Cry (Just A Little) and most recently with Out Of My Mind. The duo doesn't stop at producing hit records and touring the world; they also run their own label. Hysteria is Bingo Players' label that is home to their hits Rattle, Cry (Just A Little), Out Of My Mind, L'Amour, Mode and many more. When they are not releasing their own music, Bingo Players are releasing records from their favorite artists including Carl Trick's Mad Dash, Ralvero's Rage and Gregori Klosman's Minibar. 2013 is going to be a big year for Bingo Players live. Along with their recording success, Bingo Players have over 30 worldwide music festivals under their belts including Tomorrowland and Stereosonic. They've performed at key US festivals including Ultra, Electric Zoo and a primetime slot at Electric Daisy Carnival: Vegas. This year, Bingo Players will bring you more epic releases, an enormous live show and something to talk about.